Whether it’s fast food or premade meals in the frozen food section, fast and easy foods have only gained in popularity over the last several years. And fortunately, they’ve also become healthier. 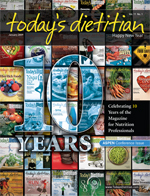 In celebration of Today’s Dietitian’s 10th anniversary, let’s take a look back at a sampling of the major trends and hot topics of the last decade. The industry has certainly experienced some big changes over the years—even the role of the RD has come a long way. In addition, omega-3 fatty acids have come to the forefront for their effect on cardiovascular disease, inflammation, and brain and nerve health, adds Joanne Larsen, MS, RD, LD, of Ask the Dietitian (www.dietitian.com). “The importance of eating fatty fish like salmon, tuna, and mackerel twice a week is now encouraged for omega-3s,” she says. Whether it’s fast food or premade meals in the frozen food section, fast and easy foods have only gained popularity over the last several years. And fortunately, they’ve also become healthier. In 2002, we reported on some of the healthy fast-food options that were emerging among chains. The average consumer wanted choices that were quick and convenient but wouldn’t ruin their diet. Food safety is one of those issues that has continually waxed and waned over the last 10 years, depending on when there was an outbreak. In 1999, Today’s Dietitian revealed that at least 60 illnesses in 12 states had been caused by a rare strain of the bacterium Listeria monocytogenes, serotype 4b. In 2002, we reported that food-borne illnesses had once again become a major health issue. Three years later, we voiced the need for better food safety policies, and, in 2008, we published a feature on the largest beef recall in U.S. history. In 1999, we found ourselves on the brink of a new century, and with it came a lot of fear. We published a feature on preparing for Y2K, writing: “As the new century dawns, hospital information systems may make errors in ordering and calculating, and may even lose medical records altogether … kidney dialysis machines may shut down automatically…” It was a time of the unknown, and many people were frightened, with some going as far as stockpiling food and bunking in the basement as the clock ticked to midnight on January 1, 2000. Of course, we know now that, essentially, nothing happened. There were some minor computer glitches but no major failures and certainly nothing that would have amounted to the catastrophic event many believed was imminent. In the last 10 years, vegetarianism has moved from the fringe to a lifestyle and green environmental choice, says Larsen. “The number of vegetarian foods has exploded, with the versatile soybean as the primary protein source,” she adds. The field of dietetics has certainly come a long way and seen many changes in the last decade. It’s difficult to even imagine where we’ll be another 10 years from now. With so many new advances and the always-evolving technology with which we’re presented, there’s no doubt the industry has a bright future. The sky continues to be the limit! Wondering where the last 10 years went—and how they went by so quickly? Here’s a little refresher with an overview of some key happenings.